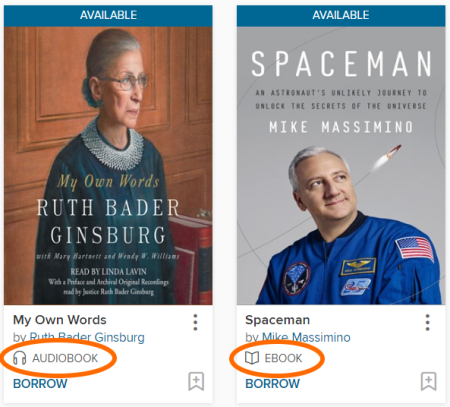 You can find a title's media type (ebook, audiobook, magazine, or video) under its jacket on the home page or a search results page in your library's digital collection. You can see the specific formats available for a title on its details page, which you can get to by tapping or clicking on the title's jacket. Note: If you're using the OverDrive app, most titles won't list OverDrive Read or OverDrive Listen in the "Formats" section (even if the title is available in one of those formats). To see and access all formats for a title, use your device's web browser instead. 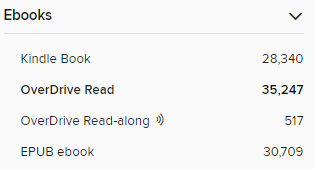 To find titles in a specific format (like Kindle Books [U.S. only]), you can either use the advanced search or the media type filters (ebooks, audiobooks, etc.) on search results pages. 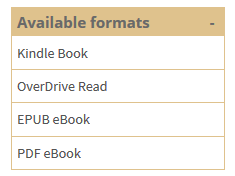 If an ebook is available in multiple formats, you can select a format for that ebook after you borrow it. 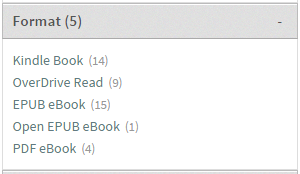 The icon in the upper-right corner of each title tells you whether it's an ebook, audiobook, or video. You can see the specific formats available for a title on the title's details page (which you can get to by tapping or mousing over the title, then selecting more). To find titles in a specific format (like Kindle Books [U.S. only]), you can either use the advanced search or the format filters on search results pages.